"It's coming! It's coming! Go, go, go!" 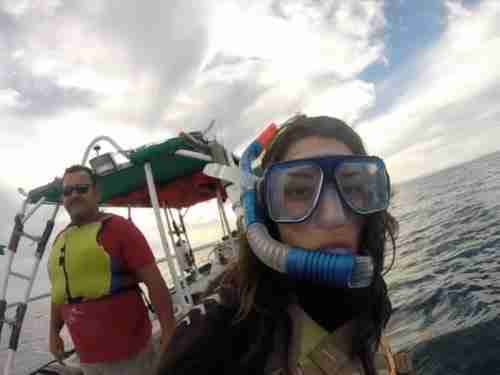 our guide yelled in military fashion as we flopped to the edge of the boat like fish out of water, affixing our masks and snorkels in a panic (or maybe I was the only one panicking). The group spilled overboard and broke into an all-out race to catch up with our target while I sat frozen on the side of the boat, one eye on the deep-blue ocean waves below me and one eye watching my friends put more and more distance between us. All I could think was, "Oh no, it's happening again." I have a very real fear of open water. Not long ago, on a snorkeling trip six miles offshore of Key West, I sat in a similar situation, watching my group swim out to sea while I failed to muster enough courage to join them before it was too late. That day, I made it only about 20 meters (approx. 65 feet) out before I had to turn around and head back to the boat out of fear and exhaustion. I thought this day would be different, but fear has strange ways of manipulating and paralyzing its prey. 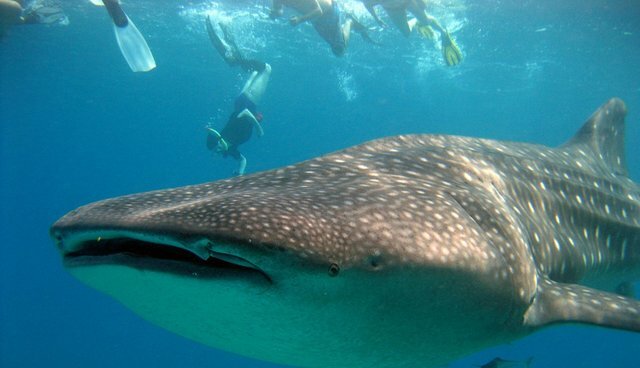 This time I was in La Paz, Baja California Sur, on a boat trip with Baja Outdoor Activities, and before me was an opportunity to swim with a whale shark, the largest fish in the world. I can't say I'm fond of sharks, and I know that I'm terrified of the open ocean. My previous experience of snorkeling with sea lions seemed inadequate for the task at hand. What got me through these elements was the mantra that I would be in the safety of my group of friends and that in about an hour, we would be warm and dry, enjoying some of Baja's best fish tacos. I would be okay. I was going to be okay. That was the truth, and I knew it. As I was beginning to wonder if my fear of water was about to get the best of me again, I realized that one of my friends had turned around to come back for me, and at the same moment our guide, Mario, shouted from the water, "I'm waiting for you!" I had no time to think it over or talk myself in or out of anything; I simply launched myself into the waves. Before I knew it, my hand was in his, and together we kicked and swam as fast as we could to catch the rest of the group, already swimming alongside the shark. Less than 10 seconds later, after we caught glimpses of its massive body beneath the surface, the shark left us all behind as it sped away, but the adventure wasn't over. As a group, we headed in the general direction it had gone, and moments later it changed course and turned back toward us. Mario's enthusiasm was almost too much for me as we trailed the shark just a bit too close for comfort. Water is a natural magnifier - need I say more? I swam with my hand in Mario's and my head above water most of the time for fear of seeing the speckled beast that seemed close enough to touch below the surface. Every time I peeked into the water to see the shark, I became a screaming, hyperventilating, laughing mess. I don't know how I could have expected anything different, but having a close-up view of a giant shark fin underwater was just about all I could handle. After we spent a couple of minutes spastically flapping along next to the graceful creature, it again sped away, leaving our group of bobbing heads hooting and hollering as if our team had just won the Super Bowl. And you know what? I was okay, just like I told myself I would be, and I couldn't have peeled the smile off my face if I tried. We had done it. I had done it. 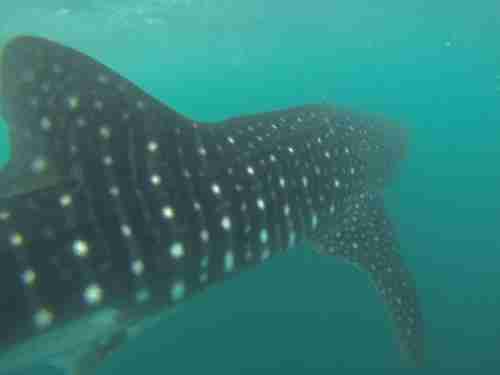 I swam with a whale shark. 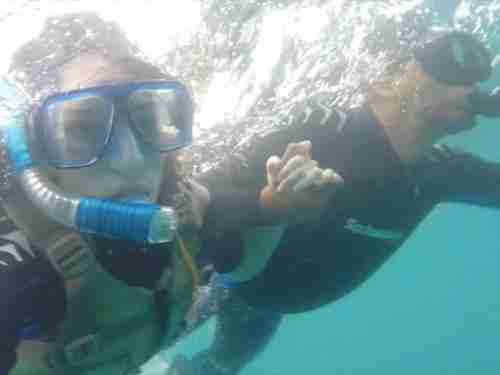 Me, the girl afraid of water (not to mention massive underwater creatures). We climbed back into the boat and cracked open some celebratory cervezas as the sun set over our accomplishment. In the wake behind us, we left the sharks that would again swim with other curious travelers the next day and the next, and we took with us a memory that will last a lifetime. I am still the girl who sat petrified on the edge of the boat staring at the water below, but I am also the girl who jumped off and swam with that whale shark, fears be damned. I can still taste the raw emotion of blowing out of my comfort zone like a charging ram and facing that shark as if it were fear itself, and it tastes so good.